Today, I am writing from my dining room area. The clouds are rolling in the metroplex. There is no sunshine in site, but it feels so cozy, so peaceful, and simply amazing to be HOME. Ive always prayed that one day when I finally had my own house, that it would be a place of peace and rest for not only myself, but for my family, and for every person that walked in the door. Hey… mission accomplished. There are so many days that I love my home so much that I never want to leave, and thats quite alright with me. Ive had a bit of down time over the last few days, and down time always leaves me “thinking”, pondering on my life.. and the grace of God. You may find that I write a lot about the grace of my Savior… and I am unapologetic for that. Just as Paul wrote in 1 Corinthians 15:10 .. “But by the grace of God I am what I am, and his grace to me was not without effect. No, I worked harder than all of them–yet not I, but the grace of God that was with me.” Grace is what redeemed my life, and I am forever grateful. Every kick, every move, every day that I look into the mirror and see my belly growing, I see a miracle. I see grace. I see love. I see redemption. For those of you who know my story, you know that I have been longing for this day to come, when I could experience child birth again. As I look over my journey, I can see that God has restored every bit of brokenness that once was… From divorce, to depression, to abuse, to death… I lived so shattered for so long… and yet now I stand and see that through surrendering my life to Jesus and his will, He took every wandering piece and restored it. He made it better than before. As Ive shared my story in the past, I was able to express how the Lord had brought everything full circle… yet there was always one part where I dreamed of the day that I would be able to see it come full circle… that being the pregnancy. Well, now I am here again… but this time around it is so different. Before, I was a 17 year old broken young girl…pregnant out of wedlock, ashamed, searching, confused…trying to make everything right in my own way…but we all know that never works. Now, here I am, serving the Lord. I am happy and whole. I have a husband that supports me in every way. There isn’t a day that goes by he isn’t grabbing my belly just to talk to Evie and let her know that Daddy is here. Evie is growing day by day. She is healthy… and I am happy to announce that I am one month passed the last time I was pregnant and went into labor with Micah. I feel like Ive conquered a milestone. The doctors said that if you have a history of going into pre term labor, your chances of going into labor even earlier than before increase greatly, usually by a whole month. But not me… not this time around. God has given me peace.. and casted out every ounce of fear. I am 30 weeks people! I have 9 weeks to go. I can’t help but to give all the glory and honor and praise to the One who has made everything new. When I saw Evie’s 4D picture.. I saw her move at the sound of our voices. I saw her heart beating… I saw those sweet eyes open…ahh my heart. As I laid there on the table.. I couldn’t help but picture the old rugged cross. The place where every ounce of shame, every ounce of death, was defeated…so that years later, I could get up from my past and start over again. Jesus Christ is good. He is great. He is the reason I live today. So every time you see me post photos of my belly, or you hear me talk about Evie… its truly my personal praise report. Ill never forget where, who I once was. I pray that to any one who has lost hope.. or feels like you have done something so “BAD” that you are disqualified to receive grace, let my life be an example that its not over. Jesus loves you… His grace is and will always be available for you. Surrender every detail and watch the miracles unfold before your eyes. My little angel. 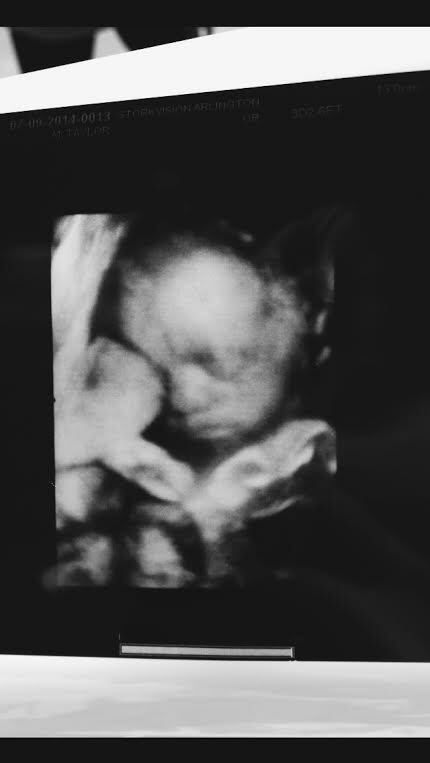 Look at those sweet little lips.. Oh y’all get ready! I am going to be THAT MOM… no shame! Thank you for writing this, I know the Lord led me here to read this and tell me, and remind me again, he is a God who restores. I can relate to this very much. And so I believe, that’s the reaon for why he led me here to this specific post. I’m not pregnant or married, but I know the surrender you speak of and the grace you’re talking about. It’s so precious and so peaceful. Gosh, I love your story..thanks for sharing and being transparent. More people want to hear the truth and honestly from others to know they aren’t alone. Thank you! Continue to let God use you and wow you in every way…God Bless! All I can say is THANK YOU for pouring your heart out in this post and sharing so beautifully the wonderful grace of our awesome God. Taylor, I don’t know how to thank you enough. My parents attend Trinity and I follow you on Instagram, but I just now found your blog. And oh it was in God’s perfect timing. I love the Lord with all my heart and am in ministry, but I have not been seeking Him as much as I should lately and have been lost. I am 18 and have so many decisions to make and eyes watching and I just feel lost. It’s 8 months since I graduated, and every month has gotten harder and I’ve started to lose hope that God will give me direction. Reading your blog posts, and reading about how God has fulfilled his promises to you, has just restored my long lost hope. Thank you, so much, for being willing to be transparent and take the time to share your heart. I too, am a singer/songwriter and writer, and even tho I am an extremely transparent person(sometimes to a fault) I know that it’s a struggle sometimes to share because you feel like it’s for nothing or that it won’t make a difference. But you have touched my heart, given me hope, and reminded me that God’s promises are REAL. May God bless you many times more than you have blessed me and may you have supernatural peace and clarity this Christmas season. Again, thank you from the bottom of my heart. Nothing can be authentic. Gain access to coming from wherever this resonates along with ideas or even heats up the mind. I really enjoy the blog post.Thanks Again. Great. I?ve read several excellent stuff here. Definitely worth bookmarking for revisiting. I wonder how so much effort you put to make one of these fantastic informative website. Way cool! Some extremely valid points! I appreciate you penning this article and the rest of the website is extremely good. I in addition to my guys have been looking at the nice items on the blog and at once developed an awful suspicion I never thanked the blog owner for those techniques. All the women became for that reason excited to read them and already have very much been making the most of them. Thank you for indeed being considerably kind as well as for deciding upon this form of beneficial useful guides millions of individuals are really needing to be informed on. Our own sincere apologies for not expressing gratitude to you sooner. Thanks for your entire labor on this website. Ellie enjoys getting into research and it is obvious why. I learn all about the powerful manner you deliver effective suggestions through this web site and therefore invigorate contribution from website visitors about this subject matter and our girl is without question learning so much. Have fun with the remaining portion of the year. You’re the one conducting a powerful job. Thank you so much for providing individuals with an extremely special possiblity to read in detail from this web site. It is often so nice plus jam-packed with a lot of fun for me and my office colleagues to search your website particularly 3 times in 7 days to find out the newest items you have got. And definitely, I am also at all times happy with your terrific tricks you serve. Certain 4 areas on this page are ultimately the most suitable we’ve ever had. I’m also commenting to make you understand what a helpful discovery my wife’s girl enjoyed going through your site. She figured out too many pieces, not to mention what it is like to possess a very effective helping heart to get the rest smoothly master chosen multifaceted subject matter. You actually exceeded visitors’ desires. Thanks for giving these helpful, dependable, explanatory and unique guidance on that topic to Janet. There as definately a lot to learn about this topic. I love all the points you have made. I and my friends appeared to be checking the nice tricks located on your web page then instantly I got a horrible suspicion I had not thanked the web site owner for those tips. My young men were definitely so happy to study them and have now in reality been enjoying those things. Thank you for actually being very thoughtful and then for considering variety of magnificent issues millions of individuals are really desirous to discover. Our honest regret for not expressing gratitude to you sooner. I really wanted to develop a brief word in order to appreciate you for all the fabulous tips and tricks you are showing on this website. My particularly long internet investigation has at the end been paid with sensible points to share with my family and friends. I ‘d tell you that we website visitors actually are undoubtedly endowed to live in a superb network with many lovely people with good advice. I feel rather blessed to have come across your entire website page and look forward to so many more brilliant minutes reading here. Thanks once more for everything. I just wanted to construct a small comment to be able to say thanks to you for those awesome suggestions you are writing on this site. My extensive internet look up has at the end been paid with beneficial facts to talk about with my family and friends. I ‘d suppose that we visitors are really fortunate to dwell in a really good community with many outstanding individuals with useful hints. I feel pretty privileged to have seen your entire webpage and look forward to plenty of more cool times reading here. Thanks once again for all the details. Thank you a lot for giving everyone a very terrific opportunity to read in detail from this site. It really is so cool and packed with a good time for me and my office mates to search your blog the equivalent of three times per week to read the newest secrets you will have. And of course, we’re certainly amazed with all the brilliant points you serve. Certain two facts in this article are indeed the most efficient I’ve ever had. Love the site– very user friendly and lots to see! I would like to show my thanks to the writer for bailing me out of such a matter. Because of surfing through the the net and obtaining thoughts which were not helpful, I was thinking my life was well over. Living without the answers to the problems you have resolved through your good review is a serious case, as well as ones that might have adversely affected my career if I had not noticed your web page. That training and kindness in dealing with a lot of things was invaluable. I am not sure what I would’ve done if I had not come upon such a point like this. It’s possible to at this time relish my future. Thanks a lot very much for the reliable and results-oriented help. I will not think twice to endorse your web blog to any individual who needs and wants support about this area. I appreciate you sharing this article. Much obliged. I intended to post you a little remark so as to say thanks the moment again for those superb suggestions you have documented in this article. This is quite seriously generous with people like you to make freely all numerous people would’ve advertised for an e-book to help make some cash for themselves, and in particular since you could have done it in case you wanted. These advice additionally served like a easy way to recognize that other people online have the identical fervor similar to mine to know the truth somewhat more related to this matter. I know there are lots of more pleasurable moments ahead for individuals that scan through your website. Thanks a lot for providing individuals with an exceptionally brilliant possiblity to check tips from this site. It’s always so nice plus full of a great time for me personally and my office peers to visit your web site at a minimum three times every week to see the new things you have got. And indeed, I’m so at all times fascinated considering the superb advice you give. Selected 2 points on this page are certainly the finest we have all ever had. I must voice my admiration for your kind-heartedness in support of those people that must have help on your idea. Your very own commitment to passing the solution across ended up being surprisingly functional and have all the time enabled girls like me to realize their aims. Your own important guideline entails a lot to me and extremely more to my fellow workers. Thanks a lot; from everyone of us. My spouse and i were really joyful that Ervin managed to finish off his investigations while using the precious recommendations he discovered from your own web pages. It is now and again perplexing to just happen to be giving for free things which usually most people have been making money from. And now we take into account we need the writer to give thanks to because of that. These illustrations you have made, the simple web site navigation, the relationships you can help to promote – it’s got mostly unbelievable, and it’s really facilitating our son and us reckon that this matter is entertaining, and that’s truly vital. Thanks for the whole thing! I’m commenting to make you understand of the excellent experience my wife’s princess went through checking your web page. She came to understand lots of things, with the inclusion of what it’s like to have an ideal teaching mood to make certain people without problems gain knowledge of certain tricky matters. You undoubtedly exceeded our expectations. Many thanks for giving these helpful, trusted, informative not to mention fun thoughts on your topic to Kate. I simply desired to thank you so much once again. I am not sure what I could possibly have undertaken in the absence of the entire advice contributed by you concerning that area. This was a troublesome issue in my opinion, however , being able to see a new specialized fashion you solved that made me to leap over contentment. I will be happy for your support and thus trust you comprehend what a great job your are doing instructing many others by way of your websites. I am sure you’ve never encountered all of us. I simply wanted to type a small message to appreciate you for some of the remarkable guidelines you are posting on this site. My extensive internet look up has at the end been paid with really good concept to talk about with my contacts. I ‘d admit that many of us site visitors actually are very much lucky to exist in a decent site with many perfect individuals with good things. I feel pretty happy to have discovered the site and look forward to so many more amazing minutes reading here. Thanks a lot once again for everything. I as well as my friends were found to be reading the best secrets on the blog and unexpectedly I had an awful feeling I had not expressed respect to you for those secrets. My ladies came certainly happy to read through them and already have really been using these things. Appreciate your really being really thoughtful as well as for considering this kind of useful themes millions of individuals are really eager to understand about. My honest regret for not expressing gratitude to earlier. Hi, Neat post. There’s a problem with your website in internet explorer, would test this… IE still is the market leader and a big portion of people will miss your fantastic writing because of this problem. I value the blog post. Want more. Once again I found exactly what I was looking for. Spot up with this write-up, I must say i believe this web site wants a lot more consideration. I’ll probably be once more to read much more, thank you for that information. Spot lets start on this write-up, I truly believe this excellent website needs considerably more consideration. I’ll oftimes be once more to read a lot more, thank you for that info. up to date list. Stay tuned and visit my website soon. I hope to add a new list in the not so distant future. you are really a excellent webmaster. The web site loading pace is incredible.It kind of feels that you’re doing any distinctive trick.In addition, The contents are masterpiece. you’ve performed a greatactivity in this subject! I’m impressed, I must say. Actually rarely must i encounter a blog that’s both educative and entertaining, and without a doubt, you could have hit the nail around the head. Your notion is outstanding; the catch is an element that insufficient folks are speaking intelligently about. We are very happy i always came across this inside my search for something about it. I value the blog article.Thanks Again. Want more. I appreciate you sharing this blog.Much thanks again. I like the helpful information you provide in your articles. I will bookmark your weblog and check again here frequently. I’m quite sure I’ll learn lots of new stuff right here! Good luck for the next! you’re really a good webmaster. The web site loading speed is amazing. It seems that you are doing any unique trick. Also, The contents are masterwork. you’ve done a excellent job on this topic! Appreciate you sharing, great article post.Really looking forward to read more. Really Great. As far as me being a member here, I wasn’t aware that I was a member for any days, actually. When the article was published I received a notification, so that I could participate in Comments, so perhaps that is it. But we’re certainly all members in the world of ideas. After study several of the blogs on the website now, and i genuinely much like your strategy for blogging. I bookmarked it to my bookmark site list and will also be checking back soon. Pls take a look at my website too and make me aware what you consider. Your IRS can even inform you of in the event the repay is actually postponed because the device contains issues with your levy go back. I am having a weird drawback I cannot appear to be able to link to your rss feed. i am using google reader Fyi. This very blog is obviously educating and besides factual. I have picked up a lot of helpful tips out of this source. I ad love to visit it every once in a while. Thanks a lot! Really informative post.Really thank you! Cool. Hello my friend! I wish to say that this article is amazing, great written and include almost all vital infos. problems with my latest website and I’d like to find something more safeguarded. Hello there, simply turned into alert to your blog through Google, and found that it is really informative. I am going to watch out for brussels. I will appreciate if you happen to proceed this in future. Numerous folks might be benefited from your writing. Cheers! I’d have to check with you here. Which isn’t one thing I often do! I enjoy studying a put up that will make individuals think. Also, thanks for allowing me to comment! Hmm it looks like your site ate my first comment (it was super long) so I guess I’ll just sum it up what I wrote and say, I’m thoroughly enjoying your blog. I as well am an aspiring blog writer but I’m still new to the whole thing. Do you have any tips and hints for newbie blog writers? I’d certainly appreciate it. There are certainly loads of particulars like that to take into consideration. That may be a nice point to convey up. I supply the thoughts above as common inspiration however clearly there are questions just like the one you bring up where the most important thing can be working in trustworthy good faith. I don?t know if greatest practices have emerged around issues like that, but I am positive that your job is clearly identified as a fair game. Each girls and boys really feel the influence of only a moment’s pleasure, for the remainder of their lives. who really understands what they’re talking about online. You need to experience a tournament first of the finest blogs on the net. I’ll suggest this site! Hi there, You’ve performed a fantastic job. I will definitely digg it and in my opinion recommend to my friends. I’m sure they’ll be benefited from this web site. I eventually stumbled upon this web site. don?t fail to remember this website and give it a glance regularly. to no backup. Do you have any methods to prevent hackers? I’m no longer sure where you are getting your information, however good topic. I must spend a while finding out more or working out more. Thanks for fantastic information I used to be searching for this information for my mission. It’s really a cool and helpful piece of info. I am glad that you shared this useful information with us. Please keep us informed like this. Thanks for sharing. Thanks for sharing superb informations. Your web site is very cool. I’m impressed by the details that you have on this website. It reveals how nicely you perceive this subject. Bookmarked this web page, will come back for extra articles. You, my friend, ROCK! I found simply the information I already searched all over the place and just could not come across. What a great web site. We stumbled over here from a different website and thought I might as well check things out. I like what I see so now i’m following you. Look forward to looking at your web page for a second time. We are a group of volunteers and opening a new scheme in our community. Your site provided us with valuable information to work on. You have done an impressive job and our entire community will be grateful to you. Howdy very cool blog!! Man .. Excellent .. Amazing .. I will bookmark your web site and take the feeds also…I’m glad to search out numerous useful info right here within the post, we want develop more techniques in this regard, thank you for sharing. . . . . .
8ae5Pp Normally I don at read article on blogs, but I would like to say that this write-up very pressured me to take a look at and do it! Your writing taste has been surprised me. Thanks, very nice article. I just want to say I am new to blogging and site-building and certainly enjoyed you’re website. Very likely I’m likely to bookmark your blog . You amazingly come with awesome well written articles. Thank you for sharing with us your webpage. I have read several excellent stuff here. Certainly worth bookmarking for revisiting. of things, thus I am going to let know her. you are really a just right webmaster. The website loading speed is amazing. It seems that you are doing any unique trick. In addition, The contents are masterwork. you have performed a fantastic job on this matter! Generally I don’t read post on blogs, however I wish to say that this write-up very forced me to check out and do it! Your writing style has been amazed me. Thanks, very great post. There is noticeably a lot to identify about this. I suppose you made certain nice points in features also. My spouse and I stumbled over here different website and thought I might check things out. website. I am hoping to see the same high-grade blog posts by you later on as well. site, how can i subscribe for a blog site? The account aided me a acceptable deal. Simply desire to say your article is as astonishing. The clearness in your post is just great and i can assume you are an expert on this subject. Well with your permission allow me to grab your feed to keep up to date with forthcoming post. Thanks a million and please carry on the rewarding work. Great remarkable issues here. I¡¦m very glad to look your post. Thank you so much and i am looking ahead to touch you. Will you please drop me a mail? Some really superb articles on this site, thanks for contribution. “Be absolutely determined to enjoy what you do.” by Sarah Knowles Bolton. But wanna remark on few general things, The website style is perfect, the subject material is very good : D.
Simply want to say your article is as surprising. The clearness in your post is simply great and i can assume you’re an expert on this subject. Fine with your permission let me to grab your feed to keep up to date with forthcoming post. Thanks a million and please keep up the rewarding work. What a material of un-ambiguity and preserveness of precious knowledge regarding unpredicted emotions. Helpful information. Lucky me I found your website by chance, and I’m shocked why this coincidence did not came about earlier! I bookmarked it. A person necessarily help to make seriously articles I might state. That is the first time I frequented your website page and to this point? I amazed with the analysis you made to create this particular publish amazing. Wonderful activity! You really make it seem really easy together with your presentation but I in finding this matter to be actually something which I believe I’d by no means understand. It seems too complicated and very vast for me. I am looking forward for your next put up, I¡¦ll attempt to get the cling of it! whoah this blog is wonderful i really like studying your posts. Stay up the good work! You realize, many people are searching around for this info, you could aid them greatly. I genuinely enjoy reading through on this internet site, it has fantastic blog posts. “Beware lest in your anxiety to avoid war you obtain a master.” by Demosthenes. I wanted to compose you one bit of word so as to say thank you the moment again for all the awesome knowledge you’ve shown on this website. This is quite extremely open-handed with you to make extensively just what numerous people could have distributed for an electronic book in making some bucks for themselves, even more so considering the fact that you might have done it in case you desired. These advice additionally served like a good way to comprehend someone else have a similar desire much like my own to figure out very much more on the subject of this matter. I am sure there are a lot more pleasurable times in the future for folks who discover your website. Simply desire to say your article is as astonishing. The clearness in your post is simply nice and i could assume you’re an expert on this subject. Fine with your permission let me to grab your RSS feed to keep up to date with forthcoming post. Thanks a million and please carry on the gratifying work. I have been checking out some of your stories and i can claim pretty clever stuff. I will definitely bookmark your site. I genuinely enjoy studying on this internet site, it holds good posts. “A short saying oft contains much wisdom.” by Sophocles. Great remarkable issues here. I¡¦m very satisfied to peer your post. Thank you a lot and i am having a look forward to contact you. Will you please drop me a mail? his web page, since here every stuff is quality based stuff.